As conditions toughened, Louis Oosthuizen and Kyle Stanley played even better. 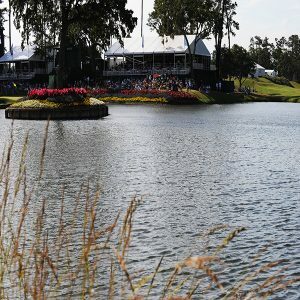 Each posted a 6-under 66 to share the lead at The Players Championship, making it even more difficult for the top two players in the world to catch them. Oosthuizen and his sweet swing were a good fit in any conditions at the TPC Sawgrass, and he managed to play bogey-free and finish with a birdie on the par-5 ninth. Stanley had eight birdies as the wind increased and the firm putting surfaces became crusty. They were at 9-under 135, two shots ahead of J.B. Holmes, who fell out of a tie with bogeys on his last two holes for a 69. Dustin Johnson and Rory McIlroy scrapped it around Friday morning, Johnson making only one birdie for a 73 and McIlroy managing through nagging back pain for a 71. They were at even par and not too bothered. They were only five behind when they finished, and they could sense that because of steamy weather and swaying pines that nobody was going to get too far away from him. Johnson and McIlroy at least are still in the game. Jordan Spieth was headed home after missing the cut for the third straight year, yet he didn’t sound terribly upset. He chalked that up to not being able to handle this strand of grass when it gets firm and crusty. Spieth’s last hope ended with a tee shot that bounced at the back of the island-green 17th and into the water. 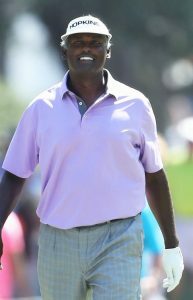 Equally surprising was Vijay Singh, the 54-year-old Fijian who was making putts from everywhere until a three-putt bogey on the 18th. He still shot 68 and goes into the weekend only three shots out of the lead. The cut was at 2-over 146, and there will be another cut Saturday because more than 78 players advanced to the weekend. That’s when the tournament will finally start to take shape, and while Oosthuizen and Stanley stood out with the best scores of the second round, both know it can change quickly. “We’re in a pretty good spot going into this weekend,” said Oosthuizen, the 2010 British Open champion who still hasn’t won in America. 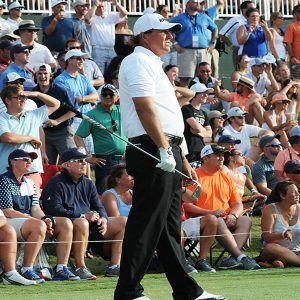 “A lot of golf to be played around this golf course, and as we’ve seen the last two days, you can easily make a mistake around this track.” Yes, there were plenty of those. Anirban hit three shots into the water and made a 10 on the par-4 18th hole. Zac Blair hit three shots into the water on the par-3 17th and made a 9. Phil Mickelson started making putts and moved up the leaderboard, only to begin a slow slide. He made three bogeys on the back nine and then, torn between a 9-iron and a wedge on the 17th, he opted for a wedge to make sure it didn’t go over the back of the island. It still hopped hard at the back of the green and went into the water, leading to a double bogey. That left him at 72, seven shots behind. 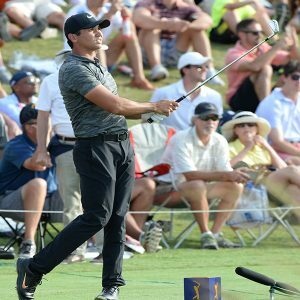 Defending champion Jason Day didn’t make up any ground, either, trading birdies and bogeys for a 72. He also was seven back at 2-under 142. Rickie Fowler shot 74 and joined Johnson and McIlroy at 144. Ian Poulter, who only got into The Players on a clerical mistake regarding his time away for injury, shot 67 and was in the large group at 5-under 139. Oosthuizen picked up birdies on both par 3s on the back nine, and then hit his best shot on the first hole from deep in the woods on pine straw. He managed to play a low punch shot with a draw, and it ran up to about 5 feet for a birdie. He let his putter do the work the rest of the way, holing 20-foot birdie putts on the fifth and ninth holes to share the lead. Thunderstorms are possible for Saturday afternoon, which might be what it takes to at least soften the Players Stadium Course. That still doesn’t change the nature of the TPC Sawgrass, which can penalize a slight miss with a big number. Among those at 4 under was Jon Rahm of Spain, who couldn’t get going because of bogeys that followed birdies and led to a 74. “I’m playing some of my best golf and I’m only 4-under par,” Rahm said. “When you have the best players in the world and the cut is over par, it shows that the golf course is very tough.” And it showed that Oosthuizen and Stanley were at their best.